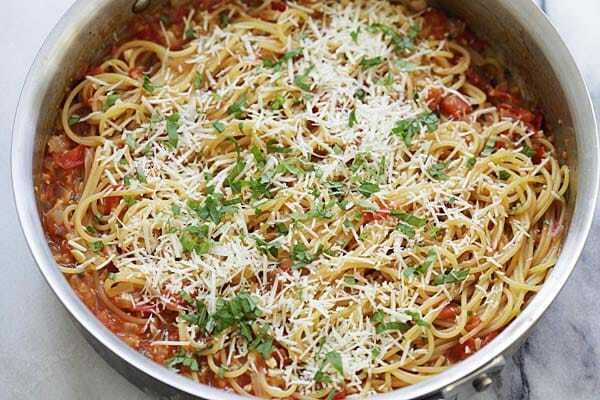 Quick and easy one-pan pasta recipe that takes 20 minutes to make. Throw all the ingredients in the pan and dinner is ready for the entire family! How Do You Cook Pasta and Sauce Together? Pasta is the easiest weeknight dinner for the entire family. This one-pan pasta will be your life saver as it’s so easy and quick. The pasta is cooked right in the sauce, in your pan, in 20 minutes. 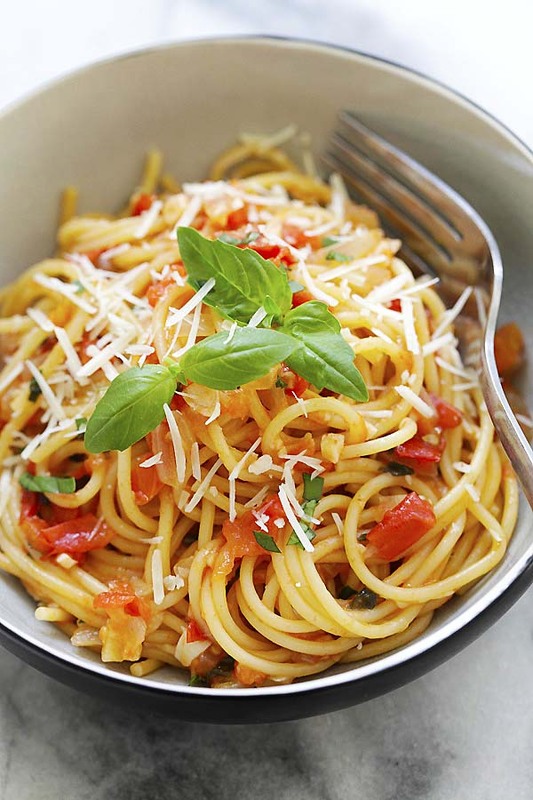 This recipe yields delicious pasta as the noodles soak up all the goodness of the ingredients. So, how do you actually cook them together? All you have to do is throw all your ingredients: tomatoes, chicken broth, uncooked spaghetti and seasonings into the pan and magic happens! There is one pan to clean up after the meal, making this the easiest pasta recipes ever! Which Pasta is Best for One-Pan Pasta? 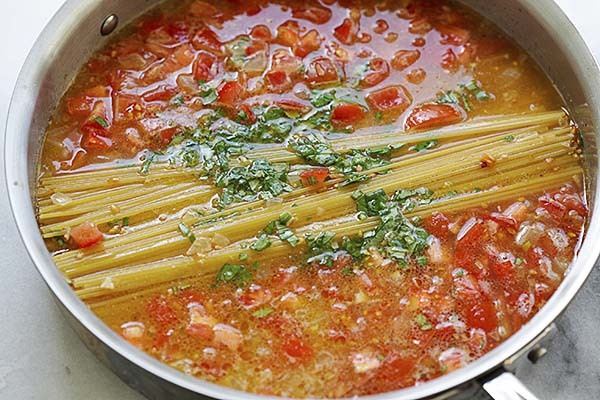 You should use spaghetti as the noodles are thinner and they will get cooked evenly in the pan. Angel hair will work well, too, but you might want to cut down the cooking time by 1 minute or so, as you don’t want soggy and overcooked pasta. For the cookware, you can use a pot, for example: a Dutch oven, or a wide soup pot. I like to use my skillet for one-pan pasta. For the best results, make sure your cookware is wide enough for the spaghetti noodles. If not, break the spaghetti into halves so they are covered by the sauce while cooking. If it is too narrow, the pasta will not get cooked properly. As I mentioned above, this is one of the best homemade Italian pasta recipes that is easy, however there are a few tips that I wanted to share with you. 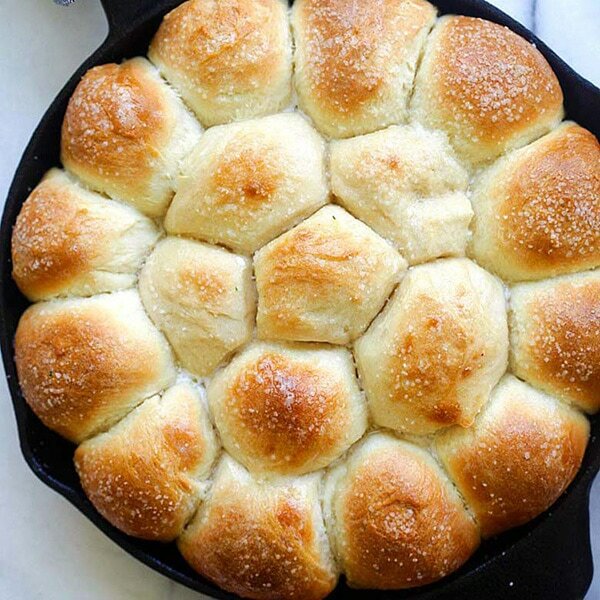 You can use any skillet to try this recipe. To be completely fail-proof, use a non-stick skillet to avoid the dry spaghetti from sticking to the bottom of the skillet. If you use a regular stainless steel skillet, remember to use the spatula to flip up the spaghetti so they don’t stick to the bottom. Add more chicken broth if the sauce dries up and the spaghetti is not fully cooked. For tomatoes, I recommend Campari tomatoes as they are juicier, sweeter and less acidic, making the Campari’s a top choice for this recipe. Trust me, there will be no leftovers, but in case you do, you can just freeze them in the refrigerator. You have keep them in a plastic container, ziplock bag, or a pasta bowl covered with shrink wrap. To eat, reheat in the microwave for 1 minute. 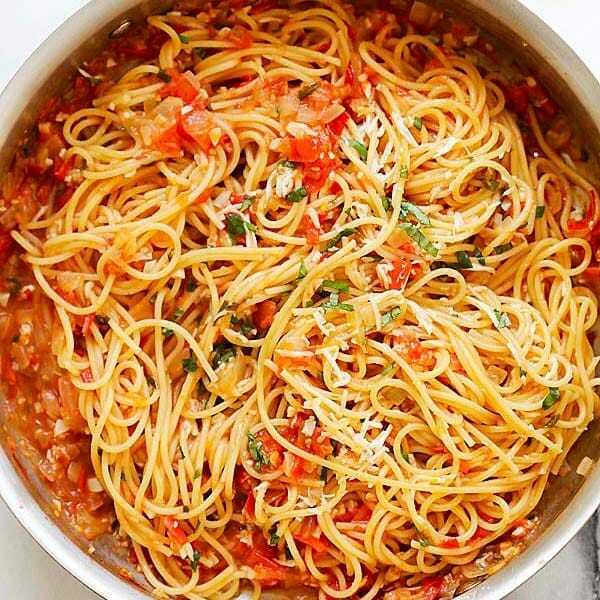 What Dishes to Serve with this Pasta Recipe? Heat oil in a wide skillet, pan or pot over medium heat. Add the onion and garlic, saute 3 minutes or until they start to brown. Add tomatoes, chicken broth, Italian basil and spaghetti. Press the spaghetti with a spatula to submerge the pasta in the liquid. 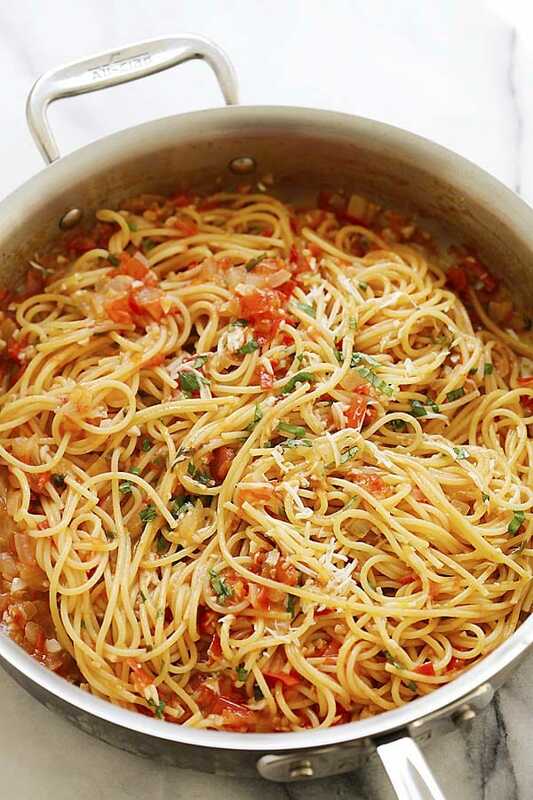 If your skillet, pan or pot is not wide enough, break the spaghetti into halves before cooking. Cover with the lid and reduce heat to medium-low. Cook for 8 minutes or until the pasta is al dente. If the pasta is not cooked after 8 minutes, add a little bit more chicken broth, cover the lid and cook for another 1 to 2 minutes. Uncover the lid and add salt. 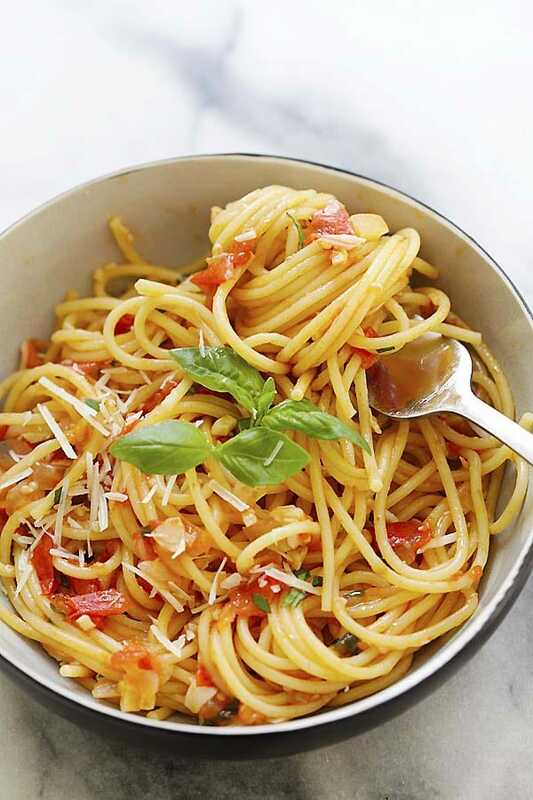 Turn off the heat and top the pasta with Parmesan cheese. Serve immediately. You may add shrimp and spinach to the pasta, if you like. I wanted to try your One Pot Pasta recipe but for some reason I can’t print out the recipe. How do I get it? How can I print your recipe for one pan pasta? There is a small print button in the recipe section. Fabulous food thank you so much. I came across this recipe on FB and went right to the stove. The only changes I made were 2 cloves of garlic instead of 6, and added wine and crushed red pepper. I say it is the best pasta I have had in many moons! Thank you for the recipe. Hi there. Wonderful and mouth watering! It seems to be delicious and strikes my eyes. I’m a new cooker and finding some pasta menu to practice. I really want to try your Quick and easy pasta recipe. I have plan to do a cooking activity with my kid so I bought a pasta maker from here https://www.eathealthyandthrive.com/best-pasta-maker/. I think it can earn more experience and fulfill my family’s time. Your recipe also make us enjoy eating. Thanks for sharing. Your One pan pasta was amazing! 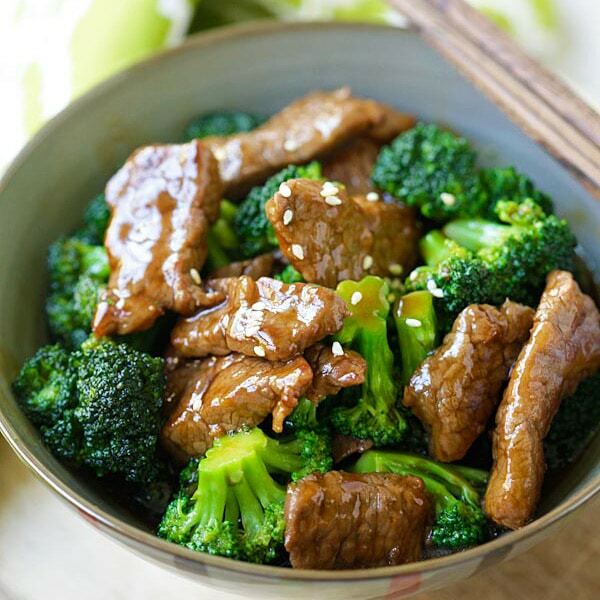 Easy to cook and taste delicious! Thanks Irene. I am so glad you like the one-pan pasta recipe. Thanks Lee!! I am so happy you like my one-pan pasta recipe! It’s best for people like me who doesn’t have much time to cook! Love this recipe as it is easy to prepare and takes little time make. Thanks for sharing! Are those canned tomatoes, fresh tomatoes, or drained canned tomatoes? Are the tomatoes fresh or canned? 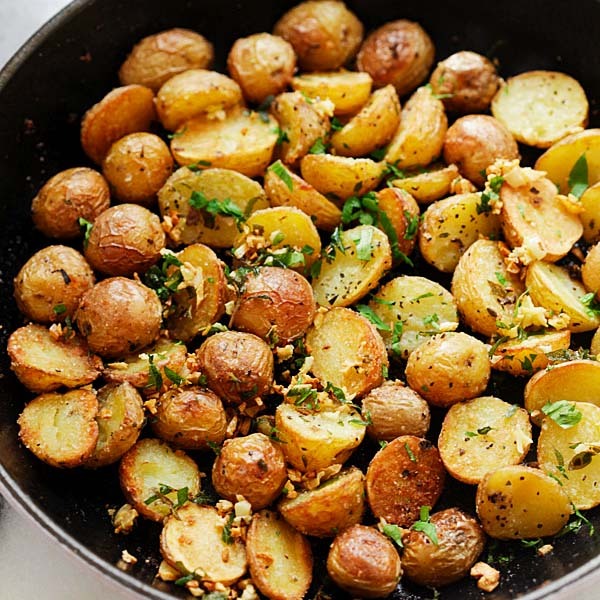 Wonderful one pot recipe. Tastes fantastic. 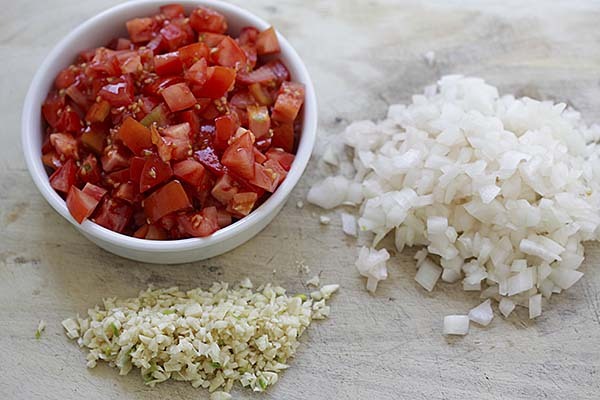 Do you use Roma tomatoes? Thanks! So you don’t have to bring schicken stock to a boil before adding the pasta? I made this last night and think it’s a perfect recipe to use as a base for all sorts of options! I doubled the recipe (used tinned crushed tomatoes), added red lentils, white wine, a dollop of pesto and sriracha at the beginning, grated zucchini and carrot towards the end, and baby spinach at the end. My husband and I both loved it and the spaghetti cooked perfectly. I’ll be creating and cooking variations of this going forward and have already shared this with my daughters. Thank you! This was so delicious! 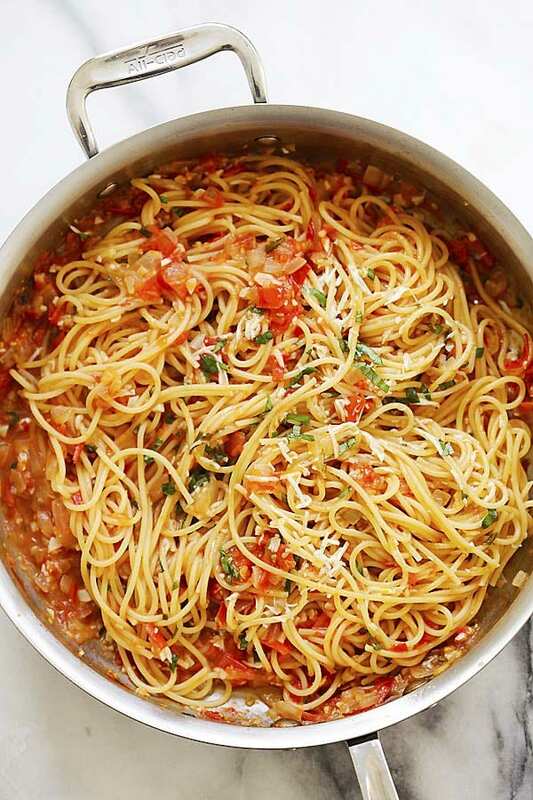 There’s nothing better than pasta, especially with tomatoes and basil! 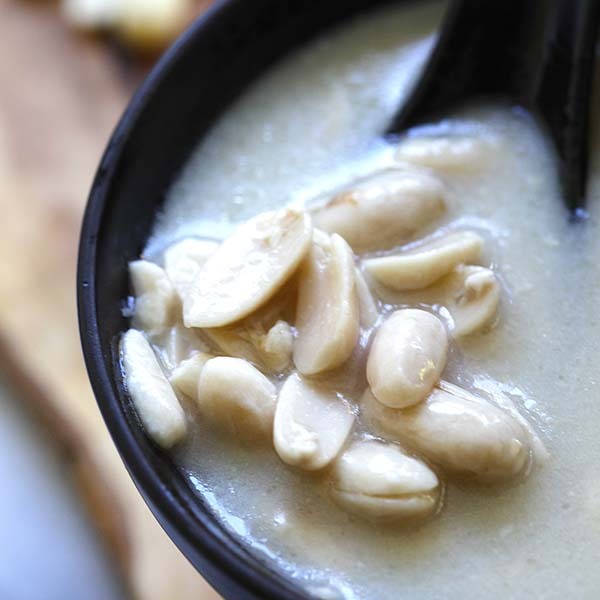 Mine took about 18 minutes to absorb the liquid, absolutely yummy recipe! Hello I just finished making one pot pasta. Love,love,love the recipe I used caned petite hunts chopped tomatoes 14.5 punch do not drain. I also added sauteed mushrooms to the onions and garlic. It was amazing, wonderful taste like something u get in an expensive Italian restaurant. Will definitely make again and again. Thanks so much for the recipe. 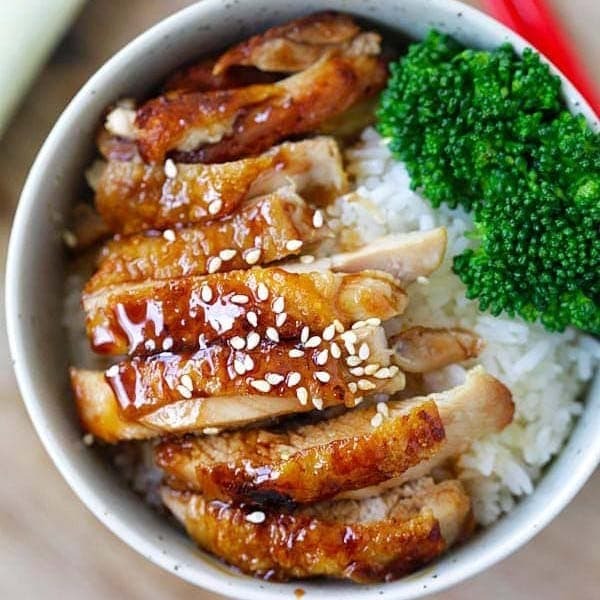 Hi – This recipe looks amazing!! If I double the recipe, can I add a 28oz can of chopped tomatoes instead of fresh tomatoes? And would I have to use less chicken stock? Hi Jane, if you double the recipe, you will need to double all ingredients, or cook it in two portions. 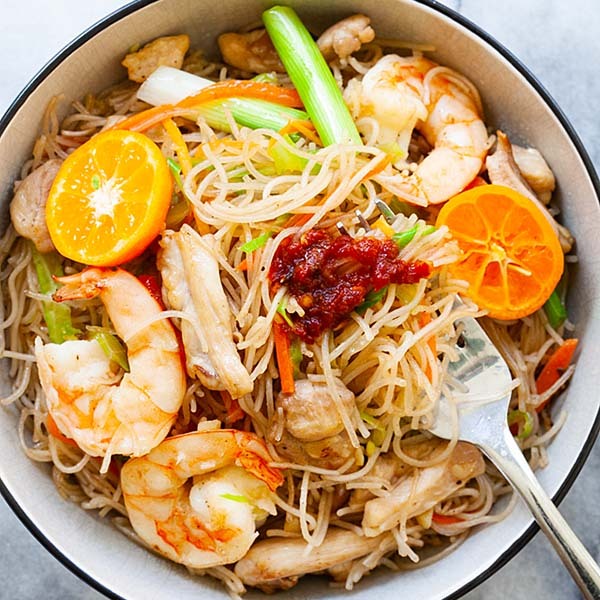 If I add shrimp to the recipe do I put in at the same time as all the other ingredients? This looks fabulous and I cant wait to try it out! You can add towards the end as the shrimp cooks faster and you don’t want to overcook the shrimp. I would add towards the last two minutes. Very tasty indeed and a hit in our household. Thank you! I added wine like others suggested here too. Gives it that kick. Love your site! Hi Yumcha mama, thanks so much for trying this one-pan pasta recipe. Just wondering if you’ve ever substituted veggie broth for chicken broth ? If so, was it just as good? No, but it should be fine! How much and what type of shrimp please? 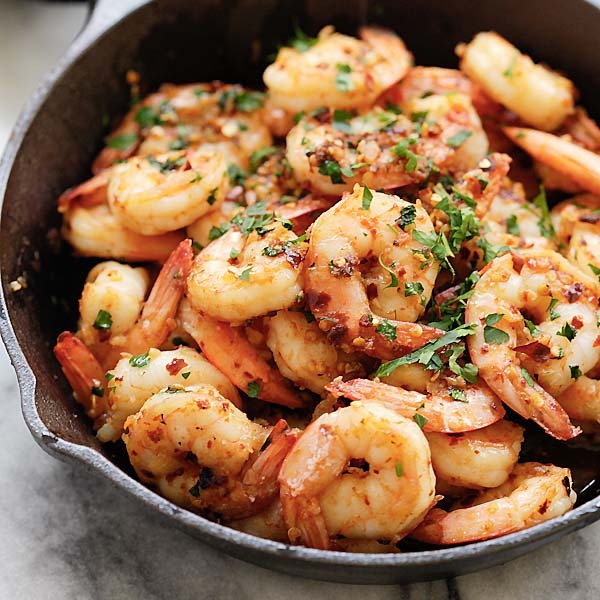 You can use shelled and deveined shrimp, 6-8 oz. Delicious pasta. I used diced canned heirloom tomatoes including the juice plus one can of water. I had some tomato juice so I added about 1/2 cup. I used enough spaghetti for two servings. I added some IKEA chicken meatballs and chopped frozen asparagus during the last 10 minutes. It was very good. Love the one pot cooking. Hi Elle, your version of one pan pasta sounds delicious, I love it.